No time to stop by the shop? Buy an E-Gift card! 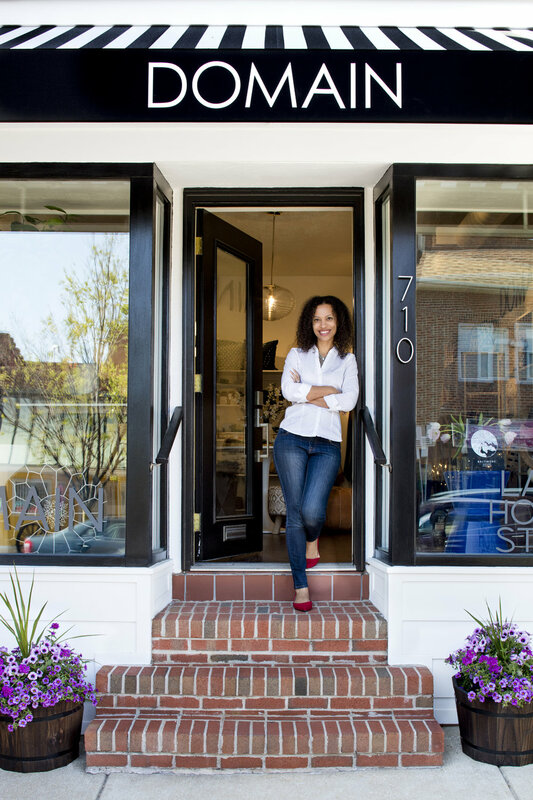 Find the perfect home accessories and gifts at DOMAIN by Laura Hodges Studio in the heart of historic downtown Catonsville. Shop our curated collection of local and globally sourced fair trade and sustainable home decor, original art, throw pillows, vases, jewelry, scarves, blankets, and one-of-a-kind pieces. Check out our upcoming events at the shop! In this class you will learn how to work with wool roving and yarn to create a one of a kind dreamweaving wall hanging that will be completed by the time you leave class. We will cover basic weaving techniques, one macrame knot, color pairing and will have plenty of time to dive into your creative process. After taking this class, you'll know how to wrap your macrame hoop with yarn, use the basic larks head knot, use wool roving to add texture and extra colors, and finish your project and turn it into a wall hanging. The class includes one macramé gold-plated hoop, fifteen feet of yarn, four feet of wool roving and one air plant. Click here to purchase tickets! Born and raised in Baltimore, Maryland, Mary Landavere’s life story weaves together her desires to both help people holistically and use her creative gifts to paint works that resonate with the viewer. Join Mary for a mixed media painting workshop that includes all materials and instruction. No experience is necessary! Click here to purchase tickets! Join Natalie Chay of Wild Sol Jewelry to create your very own adjustable stone stacking ring. This nature-inspired ring is cute and simple as it stands alone, but pairs well alongside your favorite simple rings! This ring will be customized to your unique aesthetic as there will be a number of natural stones to choose from. You will learn how to forge and hammer your ring, be introduced to a ring mandrel, and wire wrap your choice of stone to the band. The materials we will be working with are natural stones, gold plated wire, and gold plated brass. This workshop will be full of connection, creativity, and fun! Click here to purchase tickets! No experience is necessary for this intensive three-hour encaustic workshop with mixed-media artist Dorian Berman. We will start with safety, basic supplies and tools, how to prep and prime surfaces, and fuse between layers for smooth and textured effects. I will demonstrate all the fantastic possibilities of using this versatile medium- layering color, using stencils, photo transfers, embedding objects and collage material, as well as incising lines and enhancing texture. From there, you will play and explore on your own with my guidance with 1-2 8x8” wood panels, prepped and ready to paint. You will leave with your own encaustic creations. All supplies will be provided, though feel free to bring your own laser or Xerox copies (not ink jet, and in reverse) for transfers, or any papers, pressed nature materials (must be dry), or collage materials you might like to include in your final artwork. Space is limited to 6 students. Click here to purchase tickets! We respect your privacy and will never sell or distribute your email or private information. By submitting this form, you are granting Laura Hodges Studio, LLC permission to email you our company newsletter and you may opt out at any time.